Event Description: Please join us for an evening of Voices of Strength and Survival (VOSS). 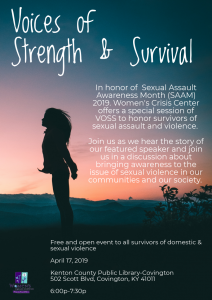 Women’s Crisis Center is excited to offer VOSS as a celebration of Sexual Assault Awareness Month. A guest speaker will share their story of overcoming sexual assault, and then the floor will be open for other participants to share their story (voluntarily! ), ask the speaker questions about their journey, or to discuss sexual assault in our society today as a group. Event is free of charge and open to the public. Light snacks will be provided and no reservation required.